By 1944, the United States and its Allied partners were occupied full-time beating back the forces of Communism, Fascism, Socialism, and many other 'isms.' A vast majority of active service members were men who were either training on domestic soil or fighting on foreign soil. That left sisters, mothers, and grandmothers to conduct a lot of the business and work production jobs that historically had been the near sole purview of men. 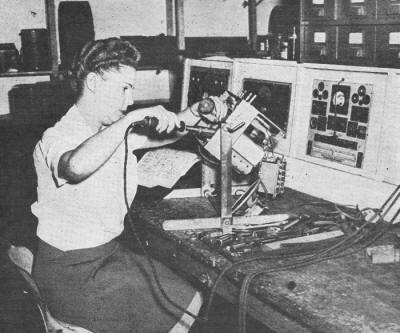 Rosie the Riveter was a very familiar symbol of that new paradigm, while less known and celebrated were the women who handled building and servicing electronics products. I have posted many articles that appeared in magazines during World War II showing the various scenarios in which women contributed mightily to the war effort, even without being in the trenches and carrying guns. 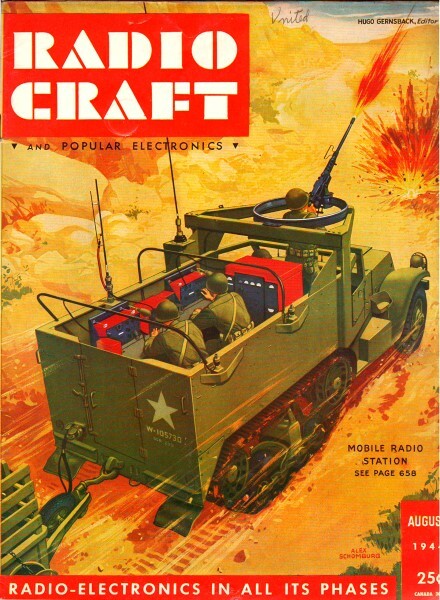 Radio-Craft ran a series of articles featuring electro-heroine Sally Mason, who applied her technical and creative prowess in battling tough troubleshooting and repair problems on military and consumer electronics. The unavailability of replacement parts required a lot of 'suitable substitutes' and jury rigging. At the bottom of the page is a short feature on a real-world version of 'Sally, the Service Maid': Mrs. Glenn Lee Cox. Fig. 1 - Sally and the Corporal get to the heart of the Edison volume control circuit. The dual variable resistor is the unrepairable and irreplaceable component. Sally Mason opened her radio shop early this fine summer morning, briskly dusted off her benches and her desk, : placed freshly-picked flowers in the vase on her desk and whistled cheerfully, if slightly off key. Her favorite tune, for the moment, happened to be Beseme Mucho. It was wonderful, just being alive on such a glorious day! She swept the floor of Sally Mason Service Maid, again dusted her desk and studied the diagram of an Edison radio combination. The schematic told her this ancient 8-tube radio-phonograph, using five 27's, two 45's and an 80 was a tuned radio frequency circuit. But she had known that, yesterday. The dual volume control, with a single-pole single-throw switch for the A.C. Line did not worry her; that was standard. But this volume control had a single-pole double-throw switch, which she had been too busy to trace, yesterday. Too busy. She put on her shop coat, sat down at her desk and her straight little nose wrinkled, then she frowned. A dual volume control with two switches was something she had never before encountered. But she would figure it out - or else! The phone rang and she said: "Radio! Sally Mason, Service Maid ... Yes, Mrs. Cartwright ... yes, I have ... No, not yet. No ... I don't think these controls are available ... Of course! ... Yes, I'm studying the diagram this very moment ... Who knows? ... Yes, Mrs. Cartwright ... Thank you, Ma'am." 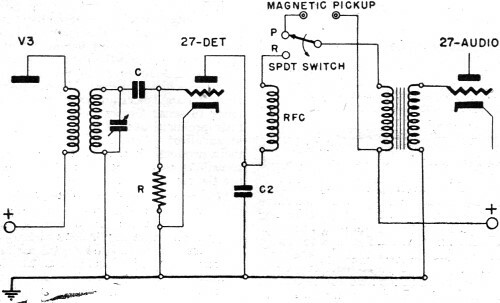 She hung up the receiver and began to stare at the schematic. So that extra switch was for the phonograph! Well! It had taken her a long time to solve that. But she had! Sally walked to her bench, turned the tuner section of the chassis over and inspected the volume control. Yes; just like the diagram. Then she shrugged. So what? What good was it? Without an exact replacement, which meant she could not complete the job, she had succeeded merely wasting her very valuable time. Next time they came in with an old radio she'd examine the volume control, first thing! Fig. 2 - Breakdown of the circuit in Fig. 1, showing the function of each part. One section of the control shunts the aerial, the other controls R.F. cathode bias. Her little hands became very busy, as she began to replace the dial cord on a Philco table model. Her mind was busier. Much busier than her flying little hands. She wondered if Dad, who was a thousand miles away, teaching radio fundamentals to men and women in the armed forces, could do anything about that Edison with its incredibly complicated, unavailable volume control. It made her grin, just to think of Dad. He could do anything in radio - or almost anything about ... well, anything! Almost tempted to write and ask him for help, she gritted her teeth and clenched a small fist. No; Dad didn't raise any quitters! Many things were on her mind, but one thought persisted in coming to the surface. She fought very hard, just as she had for two months now, not to even think of that husky young soldier boy. Yes, Technical Corporal Dan Bryner had been very nice, very helpful when she had been stuck with that Emerson. Silly of her to have used a 3,000-ohm field speaker to replace a speaker that required only a 450-ohm field! Someone was laughing. It was a man's voice. Sorry, Miss Mason," said Technical Corporal Dan Bryner a tanned hand over his mouth, "I just couldn't help it. If you could only have seen yourself!" Sally cocked her head sidewise and inspected him. He misunderstood her sudden flush of embarrassment. "I'm sorry, Miss Mason," said the Technical Corporal. Then he shrugged his heavy shoulders and grinned. "Every time we meet, I make you angry! I wonder what it is about me that you so dislike." Sally's warm smile made him grin. "You were kidding," she said, "so why can't I have fun, too? Good morning. Technical Corporal, Sir, Oh! please cancel the Sir; I remember ... now. "It's okay; fair enough," he said. Then: "How's everything these days? Any more Emersons?" "Oh, can't complain - much," said Sally. She tried to avoid staring at him, but it was so nice to see him again. So very nice. He looked different. She didn't know just what it was, but she was sure she noticed a great change in him. "I'm well, couldn't get down last month," he said, He was embarrassed, ill at ease. Then she noticed his tanned left hand rubbing his, right shoulder. "Hurt? You weren't hurt, were you, Danny?" He looked up and noticed her smooth face was suffused. Grinning, he said: "Not too much; one of the boys didn't know his own strength." "You - you mean," said "Sally, reproof in her voice, "that you had a fight?" The Technical Corporal shook his head. "No; we were practicing Commando tactics, It's wonderful stuff. But, once in a while somebody forgets how dangerous this can be. Twisted shoulder - not a bit bad. I'm okay ... now. Well, what have we on the menu for this morning? Let's see your toughest radio repair job." Fig. 3 - The new single volume control replaces the old dual unit. As the control is turned, bias on the controlled cathodes is increased. At the same time the antenna is shunted with a progressively lower resistance path. She was dying to ask him more questions, but she realized there were somethings he could not tell her. And she was not going to be nosey, particularly about military secrets! "Ever prowl around in an old Edison?" said Sally. "It's a model R5, or R4, or C4. Guess they're all about the same. I can handle everything, except for that dual volume control with the two separate switches." 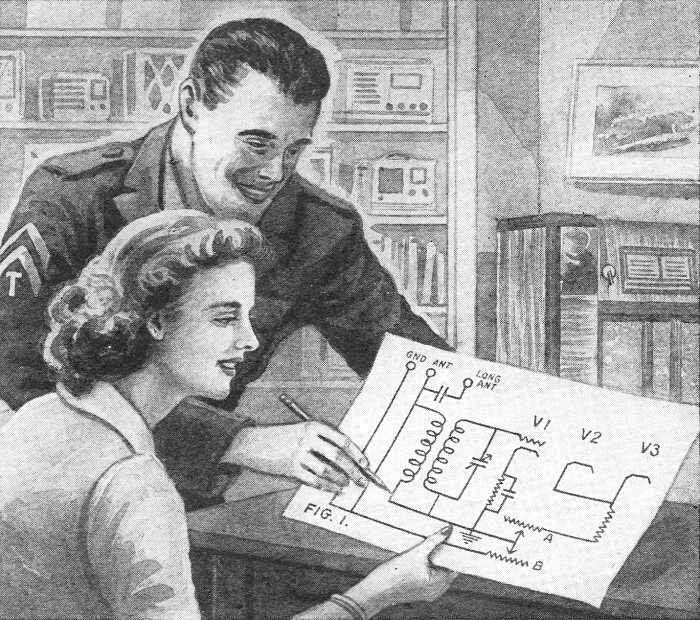 She handed him the schematic. Carefully studying the schematic, he said: "Worked on one of these - long time ago. Trouble was condensers, not the volume control. But ... H'm'm'm, lemme see ... uh-huh ... yes ... I see ... okay!" His forefinger traced out the leads in the schematic. Then he asked for a pencil and' a few sheets of paper. "This sketch," he said, "the one we'll call Figure 1, shows only the cathodes of the first four 27's, The first three, marked V1, V2, and V3, are the radio frequency stages, The fourth one is, of course, the detector tube. All that concerns us, at the moment, are the cathode circuits of V2 and V3. Only those two tubes are affected by the volume control. That's why I made their leads heavier than the rest. And don't worry because I've shown an ordinary antenna coil" instead of the special coil actually used here. We're not interested in the inductances, at the moment." Sally studied his sketch, then said: "I see only V2 and V3 are in the volume control circuit. But I can't quite visualize what happens when the volume control is rotated,"
Quickly sketching another diagram he said: "In this sketch, Figure 2, I have shown two separate volume controls, In Figures 1 and 2, each section is marked 'A' and 'B'. Now do you see?" "Oh, yes! 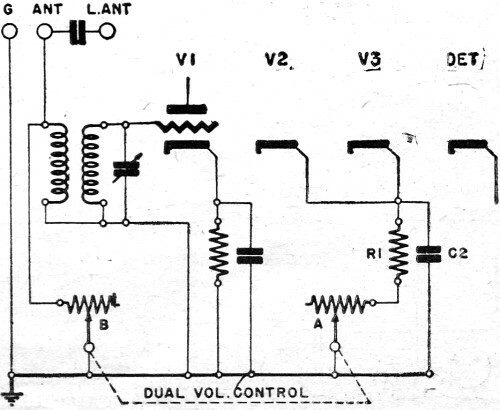 Section 'A' affects the bias of the two tubes, V2 and V3; and section 'B' acts as a variable shunt across the primary of the antenna coil. Now I get it!" "Now," he said, "let's see you make a single volume control do the work that a dual control used to do." He handed" her the pencil and their hands touched for a moment. He quivered slightly. Fig. 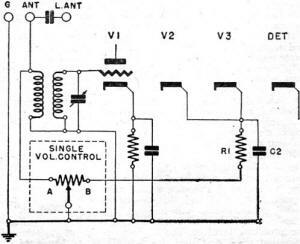 4 - The job was completed by installing a phono switch as shown in the circuit above. Sally's hand shook for a few moments and the lines she drew were wavy. Then, gritting her teeth, she made a new diagram. "Figure 3;" she said, without looking at him, "a single volume control doing the job of a dual control. As cathode resistance is decreased for greater sensitivity, the variable shunt across the antenna primary increases in resistance. Right?" He nodded. "One hundred percent." Clearing his throat, he continued : "Our standard, single control will have a single-pole single-throw switch, for the A.C. line. But we may find it impossible to find a switch which includes that extra single-pole double-throw switch, for the phonograph." "But Mrs. Cattwright - the owner - well, she insists on using her: phonograph. She loves good music. Very wealthy; she has several later radio combinations, but she prefers the Edison. She insists it has better tone quality." "She shall have her phonograph," he replied. "But we'll have to add a toggle switch, single-pole double-throw. 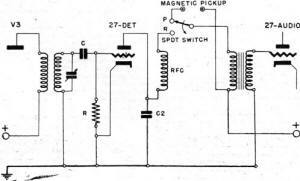 Or use a rotary switch with a pointer knob; mark it Phono-Radio, You may be able to buy one of those plates. Maybe you have one in stock." He picked up the pencil she had left lying on the counter and made another sketch. 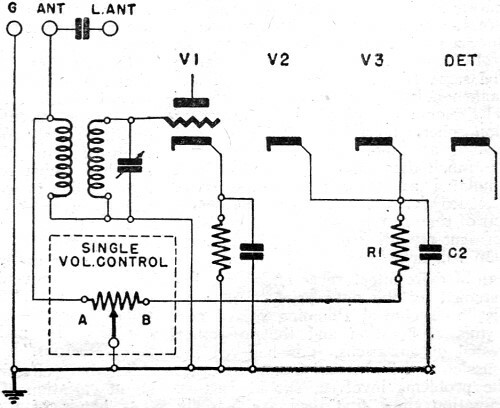 "Figure 4," he said, "shows how to connect the phonograph switch." "Thanks, Technical Corporal!" said Sally. "I wonder what I would ever do without your help." He nodded, grinned, then said: "Another thing - as this customer enjoys good music, why not rewire the phonograph circuit? Use a crystal pickup, for better tone quality. You could, of course, rewire the whole audio amplifier, but that may not be necessary. This particular model, old as it is, has pretty good tone. Besides, as she's used to it she might not like improved quality." "Thanks a million," said Sally. "I hope you realize how very grateful I am for your help. I wish I could pay you. After all, I get paid, why shouldn't you? Oh, please-!" "See you next month," said the Technical Corporal. Then he was gone! Taking over full responsibility for the business and technical ends of the Glenn Radio Co., Mrs. Glenn Lee Cox, of Washington, D. C., has scored an outstanding success in the business her husband was forced to leave for important war work! Mrs. Cox gives much credit to her technical training, which permits her to direct any part of the work, or if necessary, she says, "to do it myself!" Good "housekeeping" methods also play their part. Work is not allowed to pile up more than 10 days, when new work is refused till the old is cleared -up. She finds that customers like this better than having their radios lie around for weeks . The combination of high technical standards and systematic business methods has enabled Mrs. Cox to cope with an increasing volume of business, and the company will be ready for its post-war tasks when Mr. Cox returns to the job. How's that for a soldering iron? It could be used for soldering seams in copper guttering. Those high thermal inertia irons were needed to secure component leads and wire to the metal chassis. I have a pretty nice digital soldering station, but it takes the old standby Weller soldering gun to get solder to melt on a big metal chassis.